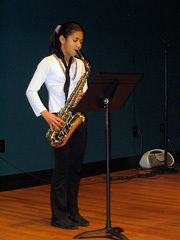 Saxophone & Clarinet Lessons – Our private saxophone lessons and clarinet lessons start at age 8 and older. Earlier than age 8, a student typically does not have the lung capacity and strength to handle these instruments. Our saxophone and clarinet instructors are proficient on both instruments so a student can start with clarinet lessons if they wish and switch to saxophone lessons without having to change instructors. Most of our students learn jazz but many work on the Royal Conservatory of Music program as well. Our saxophone and clarinet instructors actively perform in all types of bands and ensembles and as soloists. Saxophone lessons and clarinet lessons are offered in 30 minute and 1 hour lengths. Ready to Get Started? Call or visit the Academy of Music in Oakville to start learning the saxophone, clarinet or flute today! Our private flute lessons usually start at age 7 or older. As with all our instruments, the teachers have university or college degrees in their specialized instrument. Our flute lessons are offered in 30 minute and 1 hour lengths. Flute students at the Academy of Music have the option to perform in our Christmas and Summer recitals with many also performing in local music festivals and senior’s homes. Most students choose to work though the Royal Conservatory of Music program however some just want to improve their grades in school.